Football has never called my name. When I watched it, I saw the brutality, the testosterone, the pulverizing repetition. I avoided it, in fact. All sports bored me. Theatre, poetry, opera, those were the elements that thrilled my soul. In college, I chose friends and boyfriends based on a very simple criteria: no sports. I didn’t want to watch it or hear it. The only exception was when my brother played football. I promised him that if they went to State that I would dye my hair green, their team’s color. He did and I did and I cheered him on, green pigtails bouncing. Yet when my college won the NCAA National Championship in 1999, I slammed my window on the rioting outside my dorm, turned up the Maria Callas aria and went back to reading Lord Byron. I tell you this because sometimes the more profound changes in our lives happen quietly. When I first dated my now-husband, he told me he liked football. I sort-of hesitated, but reasoned that as I was 31 and not 21, I could take a chance on dating against type. I figured an occasional football game could be tolerated. Little did I understand that my guy came from the University of Tennessee tradition: not only would he watch the game every week, he would watch it with a passion. He would shout at the tv. He would listen to the pre-game show, the game, the post-game show and the coach’s call-in show. I was ill-prepared, to be sure. “What’s a Vol?” said I. He would wake me up to the strains of the Pride of the Southland Marching Band playing “Rocky Top”. And, frankly, I can’t pick a color less flattering to me than Tennessee Orange. But, despite myself, I was starting to be won over. I would wander down mid-game, book in hand, just to sit by him. I let him paint our basement orange. I learned the words to “Rocky Top” as well as the timing to add the all-important “woo!” to the last line. 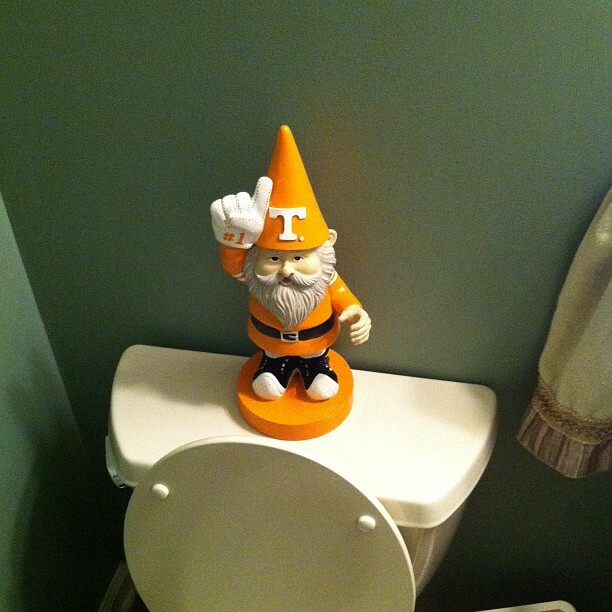 I started finding our Tennessee garden gnome in odd places. More important, I started to realize why it meant so much to the man I married: the history, the pride and tradition. 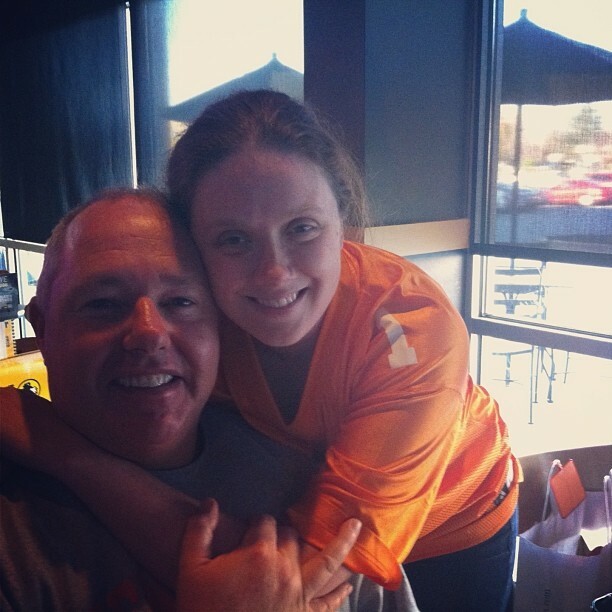 He had watched Tennessee football with his father and he watched it with his son. And now, I was lucky enough that he wanted to watch it with me. I still struggled, though. I watched, but without fervor or even much interest. I was in the room without being -present-. He deserved better. And then two weeks ago, I woke up Saturday morning and laid there, looking at the ceiling. I decided I wasn’t going to do half-hearted any more. I wasn’t going to be a football widow; I was going to be a football -wife-. So I shook him awake and said, “Sweetie, do you feel okay? The pre-game show isn’t on!” And I brainstormed with him about silly Man Cave additions. I showed him my orange socks and deemed them “lucky”. And I went and watched the game and I cheered for Big Orange. And then I was able to see the passion and the grace, the commitment in believing in something larger than yourself. And I learned that life is not about closing yourself off to new joys, but finding new ones with those you love. Dedicated to Michael, who taught me how to be a proper Vol. Here is my contribution to last week’s Mid-Week Blues Buster from Jeff Tsuruoka. This was the inspiration song, “Tu Vo’ Fa’ L’Americano” (You Want to be American? ), sung by Fiorello, Jude Law & Matt Damon from “The Incredible Mr. Ripley”. Cigarette smoke billowed through the orange-tinted spotlight, taking on strange undulating shapes as the dancers shimmied their way through the clouds. The haze obfuscated the true self. Everyone became better looking, more cool, more charming: the ineffable boost that a buzz of booze and a good smoke could confer. Except for her boyfriend. He oozed through the crowd and managed to look just as sleazy as he was. He grabbed her around the waist and swung her into the crowd, using her as a wedge to lever his way over to Marco, a prospective client. The club squealed along with the trumpet, wailed along with the clarinet, throbbed along with the deep thrum of the slap bass. The overhead lamp swung with the bounce of the beat, gleaming off Eddie’s sweaty bald forehead. Naples wore its most vivid colors tonight. Lemon yellows crashed into avocado greens; her subdued cream dress drowned in a sea of feminine attention-seeking. The heat was oppressive; even the walls of Perma-Stone siding had beads of sweat sliding along its face. “Eddie, I wanna go,” she mumbled. He pushed her further into the crowd. Her heel caught in a crack in the terrazzo and she stumbled right into Marco’s arms, knocking his partner into another couple. “Perdono, signore.” she stuttered. She had bumped her nose on his tie-tack, set with a ruby as big as her thumbnail. Marco held up a well-manicured hand to Eddie and turned to Betty. “Are you right?” he asked, in perfectly Italianate-accented English.